This is a must video if you need some motivation to stop being a part of the Standard American Diet! All contributions to Rooterville are tax deductible. You can also make a donation by check or money order. Make funds payable to Rooterville, A Sanctuary, Inc. In the spirit of the Holiday Season, we would like to express our sincere gratitude for all your support when it comes to the work we do at Rooterville, A Sanctuary! We currently care for more than 200 rescued animals of all shapes and sizes, it’s no small feat and it would be impossible to do if it weren’t for your generosity! It’s the time of year too, when we call upon you, our best friends and supporters to make your most generous gift possible to help the animals get through the winter and help us prepare for the coming year. · $6,000 buys a truckload of nutritious alfalfa or peanut hay needed for feed during winter! 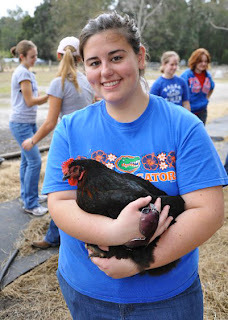 Rooterville is a non-profit organization that provides a safe haven to over 200 rescued animals. Our beautiful, serene sanctuary is located just east of Gainesville, FL on 20 acres of hills, woods, and pasture. As a sanctuary, the quality of our animals' lives is of utmost importance to us. At Rooterville, you'll find that our animals live freely, deciding for themselves how they will spend their time and with whom. No animal is confined unless he or she is sick or injured. This is one of the reasons why Rooterville is an animal paradise! The staff and volunteers at the sanctuary work toward many goals, but our primary efforts move us toward providing medical treatment and proper nourishment for unwanted, abused, and abandoned animals of all species, particularly pot-bellied pigs. We also assist in the rescue, transport, placement, and spaying/neutering of animals in need. We know that there are many rescue options available to dogs and cats, and yet, even though pot-bellied pigs are a fad pet, there are very few rescues available once the cute wears off. Because of this, we at Rooterville are strong proponents of spaying and neutering animals. There are too many unwanted pets; no one needs to be producing more. In turn, we are adamantly opposed to the practices of breeding and of buying pets from breeders. We, like so many other rescues, always have animals available for adoption to loving homes. The reality of rescue work is that it is very expensive work, and without continued funding, we simply cannot save them all. Saying “no” to someone who asks us to take an animal is difficult, but we must maintain the quality of care for the animals already here. Sometimes we can work with a family to keep a pet pig by helping them with behavioral, medical, or habitat/fencing care and upkeep. As long as an animal is being cared for, we will do everything we can to help. This allows us to maintain space at the sanctuary for emergency cases in which we truly are an animal’s only hope. We believe that institutions like factory farming hinder humans’ abilities not only to live in harmony with animals, but to embark upon spiritually fulfilling and healthful lives. As such, we are devoted to creating change in our community and, hopefully, the world over, starting from the inside out. In addition to all this, Rooterville continues to educate people who express an interest in adopting a pig, even though we do not necessarily promote these animals as pets. Still, by taking pot-bellied pigs to schools and events, we are able to educate the public about the wonderful nature of pigs and encourage those individuals to reconsider eating animals. After meeting an intelligent, friendly pig in person, we find it’s difficult for many people to continue seeing them as food. What’s more, our pigs open the door for dialogue on the practice of factory farming and the egregious suffering endured by these and other animals. To learn more about Rooterville's green philosophy, visit our Dietary Mission page. Through our network of friends and rescue organizations, Rooterville provides an avenue for all animal lovers to share information and ideas. Together, we can work to eliminate animal suffering at the hands of humans. A Healthy Diet Lifestyle, Join Us!